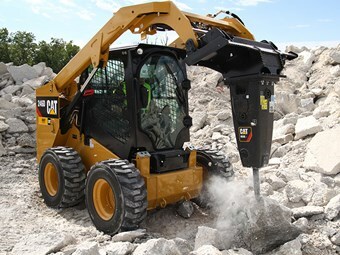 Caterpillar has released a range of E-Series hydraulic hammers designed specifically for use with mini excavators, skid-steer loaders, compact track loaders and backhoe loaders. The Cat H55E hydraulic hammer mounted on a Cat 246D skid steer loader. The new hammers are available in four sizes — H35E/Es, H45E/Es, H55E/Es and H65E/Es — and all come in both silenced and side-plate versions. The silenced (s) models use a fully enclosed housing that supresses noise and vibration. This is aimed at small-machine applications where the operator is seated in close proximity to the hammer or where the work is being done in noise-sensitive environments. The new hydraulic hammers mark an important milestone for Caterpillar, as they are the first hammers to be designed and manufactured completely in-house. The previous Cat hammer models, the D-Series, had been designed and manufactured in a joint venture with Sandvik. Recognising the need to have control over the design and manufacturing process of the hammers, Caterpillar ended the partnership in 2009. The company says this has allowed it to better integrate the hammers with its existing line of machines and attachments. Pressure and flow requirements on the E-Series hammers are set to match the auxiliary hydraulic systems of Cat machines. However, although they are designed with Cat machines in mind, the hammers can be attached to other mini excavators and loaders via an alternate mounting configuration. The E-Series hammers are suitable for machines within a weight range of between 1.1 and 9 tonnes, and all models can deliver hydraulic pressure of over 2,000psi (138 Bars). The machinery attachments feature an automatic shut-off that helps prevent blank-firing, which occurs when the hammer is operated without any rock or concrete beneath the tool. The extreme energy produced, which would normally break the rock, has nowhere to go and instead travels back into the hammer and machine. This causes increased wear and tear and greatly reduces the operating life of both the hammer and the machine. Cat says the E-Series hammer range has been designed with 47 fewer parts than its predecessor, the D-Series. This has streamlined the maintenance process and allowed for quicker servicing. Daily maintenance is limited to the servicing of a single, easily-accessed grease point, the company says, while tool changes can be accomplished using common hand tools. Click here to find Cat hydraulic hammers for sale. Click here to look up Cat hydraulic hammer specifications.